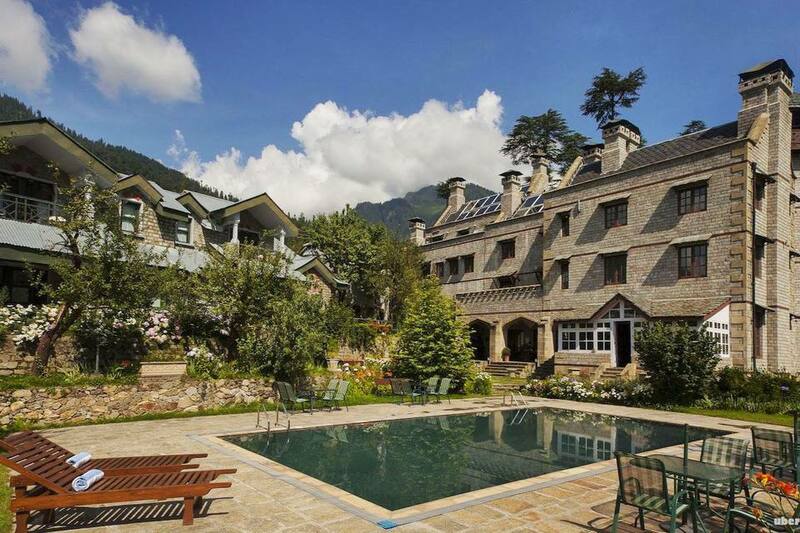 Planning on relaxing in the mountains at a luxury resort in Manali? Here are six of the best ones in and around the town for families and couples. Rates are seasonal, and peak season (May and June) rates are given below. Substantial discounts are often available during the quieter months. One of the top spa resorts in the Himalayas, tucked away amid apple and cherry orchards just above Manali town, The Himalayan will transport you back to the Medieval era in the mountains. Built in Victorian Gothic Revival style, it consists of a meticulously furnished (with antiques and collectables) Gothic facade castle, and eight cottages interspersed around an outdoor swimming pool and orchard garden. The spa's massages and skin treatments are designed pamper and detoxify the body, and there's a couples room as well. Expect to pay around 11,000 rupees per night for a double, including breakfast and tax. Urvashi's Retreat opened in 2015 in the little village of Shanag, about 15 minutes north of Manali (on the way to Solang Valley), and is one of ITC WelcomHeritage's Nature Resorts. The property is a dream fulfilled for Urvashi Singh and her family, who visited the area as tourists for two decades before setting up this boutique estate. It's crafted to be a "soul-lifting getaway" that fuses local rusticity with luxurious living. The serenity of the property is enhanced by stream that runs through it. As is the usually the case when someone pursues their passion, the attention to detail is meticulous. There are 23 thoughtfully-designed guest chalets with Himalayan pine interiors and teak furniture, and spectacular mountain views. Facilities include restaurant with diverse cuisine, bar, recreation area with pool table and movies, wellness spa and gymnasium, plunge pool, and hammocks and sun loungers around the property to chill out in. The surrounding area is ideal for hiking as well. And, homemade organic produce is available for purchase. Expect to pay around 8,800 rupees upwards for a double, including breakfast and tax. Want to stay right beside the Beas River? Span Resort is situated on 10 acres of woodland along the riverbank between Manali and Kullu (it's about 35 minutes drive from Manali town). The extensive outdoor activities at the resort make the most of the area, which is a renowned destination for adventure lovers. Yet, wellness isn't overlooked. There's a spa with four treatment rooms (including one couple's room), swimming pool, Jacuzzi, and gym. Book a seven day yoga package which includes accommodation, healthy vegetarian meals, daily yoga sessions, individual counseling, nature walks, visits to ancient temples and monasteries, and a Himalayan Ayurvedic massage. Guests are accommodated in individual cottages and rates start from around 13,000 rupees per night, including breakfast and tax. Eco-friendly La Ri Sa opened in 2015, on a five-acre apple orchard about 25 minutes south of Manali on the Naggar-Manali Road. It's curious name was inspired by the local language. "La" is above, "Ri" is the mountains, and "Sa" is the earth. This boutique resort combines all of them together. Its rustic yet modern cottages are made out of stone and wood, and all have balconies and fireplaces for those chilly nights (or days). The resort's restaurant serves a wide variety of cuisine, including local specialties. Much of the ingredients is grown in the organic vegetable garden on the premises. The resort's other facilities include a cozy bar, recreation room, library, mini theater, playroom for the kids, bicycles, wellness spa, and outdoor swimming pool. You'll never need to leave! Expect to pay 8,500 rupees per night upwards for double. This popular family resort is situated about five minutes uphill, but on the opposite side of the Beas River heading towards nearby Vashisht. There are 55 guest rooms and suites spread across eight categories, including duplexes ideal for those with kids. Many rooms have private balconies with outstanding mountain and river views. There's a swimming pool and spa, along with a diverse variety of recreational activities, plus three restaurants and a bar. The resort's expansive gardens are beautifully maintained and hiking is possible around the property. Rates start from around 11,000 rupees for a double room, including breakfast and dinner. A boutique hotel and spa, the Rock occupies a peaceful position next to the Beas River, just before Manali on the Kullu Manali Highway. There's a Spanish style outdoor courtyard for guests to relax in, along with plenty of activities including billiards tables, library, board games, kids play room, bonfire, and live entertainment. The spa offers aromatherapy treatments and massages. Service is friendly and efficient, and the food is tasty. Guests can choose from a wide range of spacious rooms, with rates starting from around 8,000 rupees per night, including breakfast and tax.